Aspiring PR pros can get great insights into the possibilities of the profession by attending one of the many awards programs taking place around the world this time of year. I try to attend several awards programs each year where I’m always inspired by the creative thinking and execution of a broad range of PR programs. Last week’s PRSA-NY Big Apple Awards recognized many agencies for programs that effectively positioned their clients products and issues. A secondary benefit of attending award programs is the rich networking potential. Even if you’re unable to attend an awards program, you can still congratulate prospective employers for their award winning work. Resourceful applicants easily can drill into the applications to find individuals who were responsible for the PR programs, and then send them notes directly. Since this is rarely done, you’ll score points and set yourself apart from other applicants. On a personal note, thanks to PRSA-NY for honoring me with the the John W. Hill Award. My career has never been tethered to winning awards, but this particular recognition of my work on behalf of the profession and this blog was much appreciated. Doug Simon of D S Simon Productions conducted this post event interview for his Vlog Views blog. 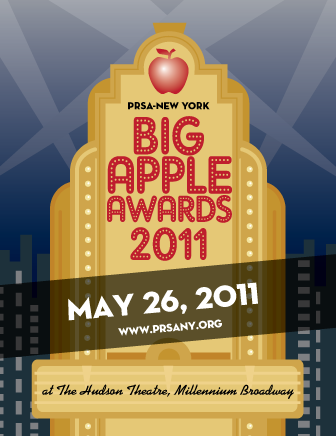 I just went to the PRSA-NY Big Apple Awards last week as a young professional looking to get into PR. I know from first hand experience this is all true. Seeing a rapid succession of the best PR programs was enlightening and inspiring. Networking with the professionals who executed them was invaluable.